Ms Price, who has been suffering from pneumonia, underwent an endoscopy and a lung wash so a camera could be inserted to examine her lungs. Doctors asked prison guards to leave the treatment room in Belfast City Hospital where Price was heavily sedated for the procedure on Friday. Ms Price was moved to Belfast City Hospital in June to be treated for severe depression after spending a year in solitary confinement in Maghaberry and Hydebank jails. The former spokeswoman for a prisoners’ welfare group developed pneumonia and arthritis, and her health is deteriorating rapidly. Mr McGlinchey said that on Friday, for the second consecutive day, his wife was hand-cuffed by prison staff against medical advice. Marian’s husband claimed that on Thursday his wife was subjected to “oppressive security” when she went to Musgrave Park Hospital for tests for her arthritis. 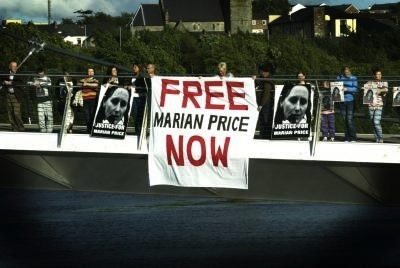 The British government last year ordered the summary re-imprisonment of Price, a political prisoner in the 1970s who has recently worked with the 32 County Sovereignty Committee. It claimed a pardon given to Price in 1980, which would ensured her release, had been lost. Critics say the move is an cleared attempt to silence a vocal critic of the new political dispensation in the North of Ireland. The abuses meted to her by the prison authorities since her internment have prompted a human rights campaign on her behalf. Her plight will be raised this Sunday as part of a major civil rights march from Coalisland to Dungannon, County Tyrone.